Elizabeth is now almost 7 months old - wtf?! 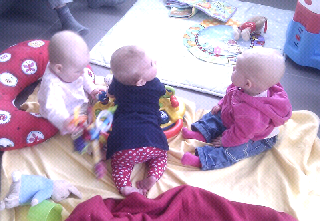 She can quite happily sit up and play by herself and so can her friends. When we met up on Wednesday for coffee and a chat, they were playing together. So very cute! Elizabeth is on the left and the little girl in the middle can crawl. She scooted over to play and it was lovely to see a glimpse of what's to come. View the other submissions here.